Minnesota State Parks and Trails I Can! 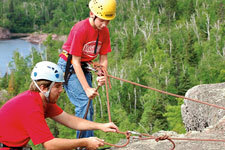 programs take you and the kids from "I've never done that" to "Wow, that was a blast!" Designed for families to try any or all for the first time. These one- or two-night overnight programs are your chance to introduce your kids to the fun of camping—no experience necessary. 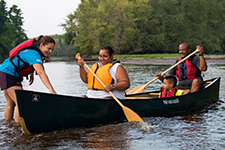 Your kids will discover the kind of amazing views only seen from the water during one of these programs designed especially for first-time paddlers. 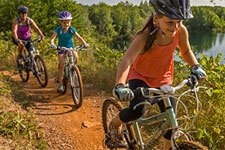 Remember your kids' joy and triumph when they first learned to bike? Take that joy off-road with this exhilarating program. Share the fun of casting into the water and the excitement when there's a tug on the line. 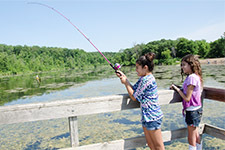 This program is all about the anticipation and thrill of your kids learning to catch fish. 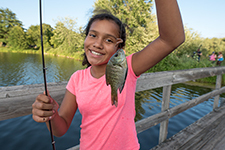 Aprende a pescar con tus niños en el nuevo programa de I Can Fish! (en español)… ¡y disfruten de la emoción al sentir el tironeo en la línea! Be your own action heroes and go beyond video games! 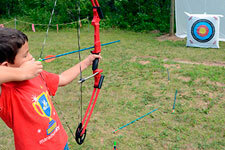 This program lets you share the exact moment when your child first aims for a goal and hits it. The I Can Climb! program was discontinued in 2017.